Please Note: Nutritional values listed may vary from final results depending on actual measurements, products and brands used to prepare the recipe. Place the chicken in a zip lock bag along with 1 tablespoon olive oil, 1/4 cup balsamic vinegar, 2 cloves minced garlic, and a pinch of salt and pepper. Massage the chicken, mixing everything around to make sure the chicken is fully coated. Refrigerate for at least 30 minutes prior to cooking. While the chicken is marinating, make the balsamic reduction. Stir the remaining 1 cup balsamic vinegar and honey together in a small saucepan over high heat. Bring to a boil, reduce heat to low and simmer until the vinegar mixture has reduced to about 1/3 of a cup, about 15 minutes. Set the balsamic reduction aside to cool. Combine the tomatoes, onion, remaining 2 cloves of garlic and 1 tablespoon of olive oil in a medium bowl and set aside. Heat a cast iron grill pan to medium high heat and grill the chicken on each side until cooked through, about 7 to 10 minutes. While the chicken is cooking, turn the oven on to broil. 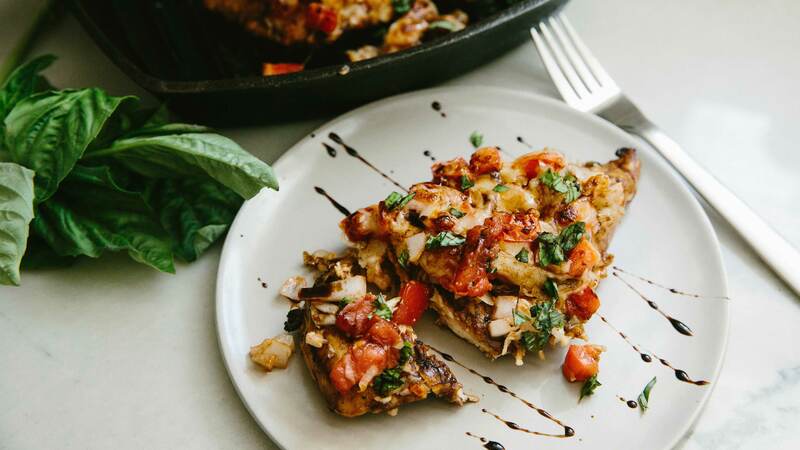 Top each piece of chicken with about 1/4 cup of the tomato bruschetta topping and about 1/4 cup of shredded cheese. Place the cast iron grill pan in the oven under the broiler. Cook until the cheese is fully melted, about 5 to 10 minutes. Drizzle with balsamic reduction before serving. Save extra balsamic reduction in airtight container for later use. Note: if you do not have a cast iron grill pan, you can grill the chicken separately and place on a baking sheet in the broiler. Please note that some ingredients and brands may not be available in every store. Be the first to comment on this recipe!